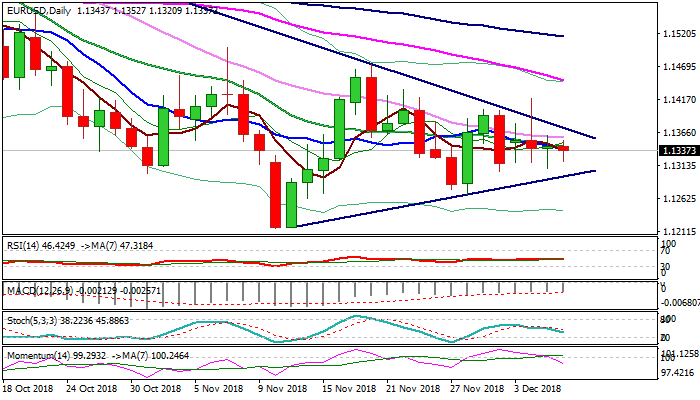 The Euro stands at the back foot on Thursday following triple Doji in past three days but remains within near-term congestion and still without clearer direction signal. Strong upside rejection on Tuesday continues to weigh and bearish near-term bias remains in play while 30SMA (1.1357) caps. Strong bearish momentum on daily chart adds to outlook. On the other side, recent downside attempts were repeatedly limited by 200WMA at 1.1311 (several spikes lower but without close below), keeping bearish action limited. Initial direction signals could be expected on lift above 30SMA or break below 200WMA, while confirmation requires break above triangle resistance line (1.1368) or break below support line (1.1301).